Volume 2 of Zorn's Book of Angels features the original Masada trio: Mark Feldman (violin), Greg Cohen (bass) and Erik Friendlander (cello). Again, it's jazz, though deefinitely leaning on the third stream or classical/chamber sound. But this set is definitely more in the jewish music setting as well. Like I also said before, if you have always been wary of getting into Zorn's works, Book of Angels is probably the easiest to get into (though not necessarily representative). Marvelous, beautiful stuff. Feldman's violin is especially prominent. When saxophonist/composer John Zorn first introduced Masada in 1994, it’s unlikely that he could have anticipated it would become so successful. The first songbook was originally developed for his adventurous but clearly jazz-centric quartet featuring trumpeter Dave Douglas, bassist Greg Cohen, and drummer Joey Baron. Since then Zorn’s compositions—brief sketches meant to encourage exploration and interplay—have been interpreted by a wide variety of ensembles, ranging from the raucous Electric Masada to the elegant but still rhythmically propulsive Bar Kokhba Sextet and the chamber recital approach of Feldman and Courvoisier in duet. Special projects, including Masada Guitars and Voices in the Wilderness, have demonstrated the remarkable adaptability of Zorn’s songbook. The Masada String Trio is Zorn’s most accessible ensemble, although it makes absolutely no compromises with the probing spirit that has rendered the Masada project his most endearing and enduring work. While the trio—violinist Mark Feldman, cellist Erik Friedlander, and bassist Greg Cohen—has been at the center of a number of Zorn projects including Filmworks VIII (Tzadik, 1998) and Filmworks XI (Tzadik, 2002), it’s been nearly a decade since they have recorded a studio album of new Masada material. With over 300 tunes composed for his second Masada songbook, Zorn is in a different and more advantageous position. Whereas the bulk of the first book was first introduced by his flagship quartet, this time he can inaugurate the material using the wealth of musical contexts that have become part of the larger Masada universe. Astaroth: Book of Angels Volume 1 found long-time associate Jamie Saft approaching ten new pieces from a piano trio perspective. 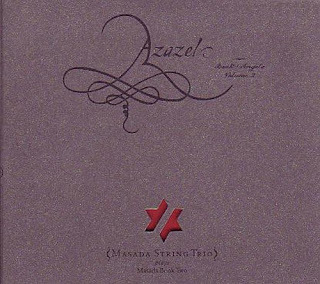 Azazel: Book of Angels Volume 2 reconvenes the Masada String Trio and, like Volume 1, demonstrates that there’s plenty of life left in the Masada project. Like Astaroth, Azazel remains undeniably a Masada project, though it demonstrates a wider stylistic purview than the first songbook. Additionally, the trio has clearly evolved as a unit, with Feldman and Friedlander especially notable for shifting roles from support to lead so seamlessly that the changes are virtually invisible. Azazel: Book of Angels Volume 2 is a strong argument against naysayers who accuse Zorn of milking the Masada project dry. With a large community of artists from which Zorn can now draw for Masada, there seems to be no end to its potential, and the Masada String Trio proves that it’s possible to create challenging and multifaceted improv-based chamber music that doesn’t sacrifice widespread appeal.